Heck yeah, cauliflower again. It’s maybe a little weird to say about a food that isn’t Doritos, that isn’t cheese, that isn’t margaritas, and that borderline stinks… but I really do love this stuff. A couple of times a week, I cut up a head of cauliflower and a couple of crowns of broccoli. They either make their way onto baking sheets with a variety of spices for roasting or they make their way onto a double-layer of foil with a variety of spices for grilling. Either way, they make their way. The upside is that there are almost always some form of cooked plant-things ready to be reheated for lunch and dinner. Because here in hell – literally hell, if you have ever experienced 11 minutes of August in southeast Texas – apparently Doritos don’t count as a serving of plants. 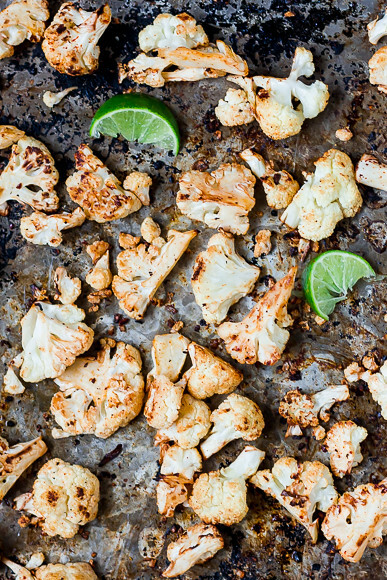 In this pan, cauliflower is tossed with fresh lime juice, a light dusting of chipotle chile powder, and garlic. You can use any chili powder but I think chipotle powder is the best to use here: it’s smokey and spicy. 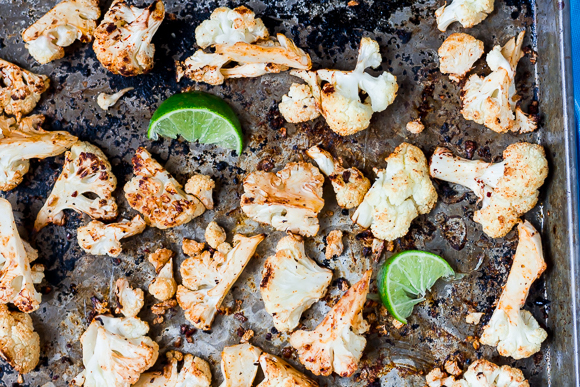 Roasted cauliflower gets a smokey, tangy kick from chipotle chili powder and lime juice. Spray a baking pan with olive oil. 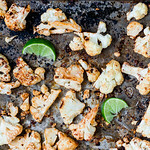 Spread the cauliflower in an even layer and lightly spray with olive oil again. Sprinkle with salt, pepper, and a light dusting of chipotle chili powder - use less if you aren't a fan of spice, use the full teaspoon if you are. Roast for 10 minutes, toss/flip, and roast for another 10 minutes. Serve warm, leftovers reheat in the microwave. Have had this recipe saved for a month! Am finally getting around to it! Can’t wait for it to get out of the oven.